Effects 101 - Tremolo: What the hell is it and how does it work? sound), but do you know HOW it does this? Somebody just figured out how to take the sound a Floyd Rose makes and put it into a circuit, right? Simple! Errr… no. I suppose another research project would be figuring out how Floyd Rose and others started using the term “tremolo” for their products, but it’s a very inaccurate term. Think about it for a bit, when you shake the whammy bar on your guitar, does it sound remotely similar to a Fulltone Supa Trem? That’s because the two devices are doing completely different things to your sound. The tremolo (pedal/effect) is manipulating volume, while the tremolo (tailpiece) is manipulating pitch. The tailpiece part of that should be pretty obvious, which means all those goofy folks that insist on calling your bridge a “vibrato” are 100% correct in their terminology. So one last time, tremolo is volume, vibrato is pitch. Got it? Cool, let’s dig deeper. So how does a tremolo pedal work? Probably the most common and simplest (with modern technology) is to modulate input voltage via circuit. This is how your typical Boss tremolo works. In this scenario, a voltage controlled amplifier (VCA) adjusts signal amplitude with a specific waveform to create the tremolo sound. (Don’t worry, I’ll explain the waveform options below) These tremolo pedals often sound nice and work reliably, but similar to listening to vinyl, there are many people who prefer some of the imperfections of other technology. Other types of tremolo technology involves a low-frequency oscillator, which feeds the signal back into the amp in-phase, causing a tremolo sound. The low-frequency oscillator helps create the tremolo effect by controlling the speed and as far as I know, only produces a sine wave. Expanding on that technology, some tremolos use the low-frequency oscillator combined with high and low pass filters. This is how many older Fender tremolos work as well as the Catalinbread Pareidolia Harmonic Mesmerizer tremolo. Next up, tube bias. With this tremolo, the low-frequency oscillator is controlling the power tube bias. Essentially acting as a dimming switch for the bias that goes up and down, resulting in a nice tremolo effect. 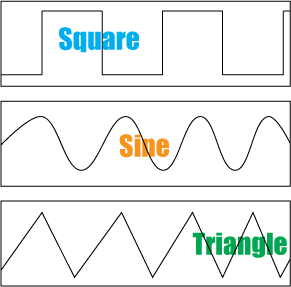 For the purpose of this fairly basic article, we’ll focus on three waveform patterns; square, sine and triangle. Forgive the imperfect drawing below, but it gives you a very good example of what a tremolo is doing to the input signal. Square wave – this is how a digital sound wave is represented. The up/down pattern depicts the on/off nature of digital. In a tremolo, it’s the very hard tremolo sound where you can hear the signal go completely silent during oscillations. Sine wave – the traditional tremolo effect. The sound is a fairly smooth up/down pattern similar to moving your volume knob up and down. This is an analog sound wave, but digital devices can replicate the effect to varying degrees of effectiveness. Triangle wave – kind of a hybrid in the sense that it has a smoother effect like a sine wave but cuts quickly. Square and triangle waves have only odd harmonics, which gives them similar characteristics. (Electronics) I’ve been trying to seousirly begin playing the guitar for a while, and I bought this one in hopes that spending money on an electric would motivate me more than just using the acoustic that I never had a rapport with. I bought this Silvertone as a starter kit, just looking for something solid and inexpensive. I settled on this one because most of the other guitars in the price range were Austin Bazaar, and Austin Bazaar seems to make very low-quality starter kits in hopes that people who don’t know better will buy them. This guitar has done exactly what I wanted, I can’t stop playing it. It comes with everything you need as a beginner it’s already stringed (with light gauge strings, which are good to start with), has a spare set of them as well, picks, amp, tuner, and cable. The only thing you could possibly want added would be a distortion pedal, but a beginner has bigger things to worry about. I have had no problems at all with the guitar. It is solid and well-built, very satisfying to play. This is probably the best deal you can find on a starter kit.